Biographical sketches of Latanya Sweeney, Ph.D.
Biographical sketch of Latanya Sweeney, Ph.D. 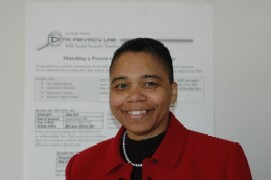 Professor of government and technology in residence at Harvard University, Editor-in-Chief of Technology Science, director and founder of the Data Privacy Lab, former Chief Technology Officer at the U.S. Federal Trade Commission and Distinguished Career Professor of Computer Science, Technology and Policy at Carnegie Mellon University, Latanya Sweeney has 3 patents, more than 100 academic publications, and her work is explicitly cited in two U.S. regulations, including the U.S. federal medical privacy regulation (known as HIPAA). She is a recipient of the prestigious Louis D. Brandeis Privacy Award, the American Psychiatric Association's Privacy Advocacy Award, an elected fellow of the American College of Medical Informatics, and has testified before government bodies worldwide. She earned her PhD in computer science from MIT in 2001, being the first black woman to do so, and her undergraduate degree in computer science from Harvard University. Dr. Sweeney creates and uses technology to assess and solve societal, political and governance problems, and teaches others how to do the same. More information is available at her website, latanyasweeney.org.